SprutCAM enables creation of CLData for 2, 3, 4 and 5 axis machines for laser, plasma and water jet cutting. The sequence of how the parts are cut out is controlled, which prevents cutting out of the external contour containing uncut parts. In this operation first the internal contours are machined, external contours being the last ones to be machined. Oxygen cutting is based on the ability of the metal to burn down in a flow of a pure oxygen. This same flow takes away the ensuing combustion products. Acetylene, propane or natural gas is used as the fuel. The plasma cutting process is based on using of air-plasma arc of constant current of direct application (cathode is the electrode, the metal being cut is the anod). The process consists in the local melting and blowing out of the melted metal with creation of the cut cavity when the plasma cutter is moved on the metal being cut. The tool for the water jet cutting is a specially formed liquid flow, coming out from a special nozzle with diameter 0.08 – 0.5 mm at the supersonic speed (1000 meter/second and more) which provides a working pressure of 400 Mpa and more on the workpiece. As the distance between the nozzle section and thmillimetersis a few millimiters, the flow pressure exceeds the material resistance limit and this is how the cutting is done. The abrasive material in the flow increases its cutting capacity, the abrasive liquid can cut hard materials of considerable thickness. Laser cutting implies no mechanical contact with the treated material. The focused laser radiation allows cutting and graving of almost any material, regardless of its thermophysical properties. The precision of the laser head is around 0.08 mm. which permits to have a high precision of the reciprocal position of the workpiece elements. Laser cutting can be applied to the easily deformed and not rigid workpieces. The laser beam has a diameter around 0.2 mm, which allows creation of holes with diameter 1 mm. The high power of the laser radiation guarantees a high efficiency of the laser cutting. Laser cutting enables cutting almost any type of sheet material even with a complex contour. From the point of view of the writing of the NC programs for the cutting methods mentioned, the choice of the exact cutting method does not have a crucial importance. For instance, the command for the turning off of the plasma (M53), when working with the plasma equipment, and the command for turning on of the alternator (M73), when working with the laser cutting is pretty much the same from the point of view of how it is realized in the CAM system. So the NC program writing for laser, oxygen, plasma and waterjet cutting can be done in the same module of the CAM system provided there are the postprocessors in question. CAD systems are used to form the profile of the parts being cut out and form a cutting sheet on their basis. The requirements for such systems are set depending the carachter of the parts being cut out, their number, profile complexity. For instance, if a plasma cutting machine is used in making of a large number of parts of various complexity, one of the top requirements is to have an optimal lay out of the parts on the sheet which provides maximum coefficient of the material used. On the other hand, when the sheet doesn’t need to be filled in completely with the parts to cut out, the emphasis is on the geometry editor and sophisticated imports methods from the modeling systems (CorelDraw, RhinoCeros). Contour cutting sequence optimization according to the lengths of the passes, taking into consideration the inner contours. The contour cutting sequence is determined automatically, taking into consideration the inner contours. This has to be done in order to avoid the untimely cutting out of a part with uncut parts inside. Besides that, the system provides the optimization of the machining sequence taking into account the length of the passes between parts. The system has an automatic creation of the positions for the tool penetration, depending on the approach chosen, avoiding a cutting of the neighbouring parts. In order to avoid the bad angle cutting of the part, the system has several methods of forming of tool path in the angles. 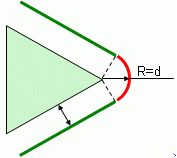 The passing of the angles can be set automatically or manually, depending on the angle. In order for the cut out pieces not to fall out from the sheet, you can leave several crosspieces on their contours. After the cutting, the cross pieces are cut and the parts are taken out from the sheet. number of crosspieces for each curve is variable and depends on its surface area. Often, the machined piece will bend because of the thermo treatment and it can break when the cutter head is moved above it. In order to avoid such situations, the passes between cutting in points can be done above the unmachined zones of the sheet. When the function is turned off, the passes will be made following the shortest distance between the points. When the function is turned on, the passes are made in such a way, that the cutter head avoided passing above the already cut out contours. The CLData is checked in the machining simulation mode. The cutting simulation assures visual control of the quality of the CLData. Non exhaustive list of producers of cutting equipment: Flow International Corporation; Water Jet Sweden AB; Bystronic; Trumpf; Sato Schneidsysteme; Aliko; Trenntec; ESAB Welding & Cutting Productions; Digital Control etc.